Those allegations have now died down, with what must be one of the most successful resettlement programmes in recent years for a country that had suffered so much displacement. The UNHCR team that came to monitor the Shelter Grant programme noted that commercial activity too had begun, indicating the confidence of the returnees in the process. Attention then shifted again to the issue of war crimes, fuelled by a video sent to several media outlets. Only one used this initially, and they did not make the video they received available for inspection. Several factors in the video have been shown to be suspicious, and though one UN Rapporteur has made much of it, the investigation he belatedly requested has revealed problems that suggest some tampering. Understandably enough the UN Secretary General has noted that the Rapporteur does not speak for the UN. Another story that has gained popularity is that some Tigers who sought to surrender were shot. The story was propagated initially by a British journalist who claimed involvement in negotiations in this regard, but it died down until the former Army Commander was reported to have declared such an incident occurred on his responsibility, contrary to orders from those in air conditioned rooms. What seems an attempt to denigrate the civilian leadership of the forces when the General was seeking to create a macho image of himself was contradicted a few months later by a report that he claimed it was the civilian leadership that ordered the shooting. Though he then clarified that report, the way the story was propagated suggests that propaganda continues to be the reason, and that no command responsibility can be attributed for any wrongdoing, whatever the General’s contradictory views of what might or might not have happened. So too, while agencies that are in the forefront of developing new fashions to attack Sri Lanka now have moved to the issue of former combatants, the government had already dealt almost completely with the Child Soldiers the LTTE recruited in such abundance, even while UNICEF turned a blind eye to their continuation of open recruitment of 17 year olds and their failure to release those who were younger. Government has now provided education at a good school in Colombo for the youngsters, while those now grown up have practically all been released. With regard to the older ones, the rehabilitation process is still ongoing, though it is slow because of shortages of funds. However the classification has now been done, and it is clear the bulk of the 10,000 or so who had surrendered will need very little rehabilitation. The Action Plan prepared by the Ministry of Disaster Management and Human Rights lays stress however on proper vocational and social training, and this will continue under the Commissioner General of Rehabilitation, who functions under the Ministry of Justice. In short, in areas connected with the conflict, the record of the Sri Lankan government and its armed forces compares favourably with any other which has had to deal with terrorism. As head of the Peace Secretariat, I monitored allegations even on pro-LTTE websites very carefully, and generally found an acute awareness of the need to proceed in accordance with law. To cite a characteristic example, our air force engaged in over 400 air strikes from the start of the Northern offensive until early in 2009, and in only about 30 of these were civilian casualties even alleged by those websites. In over 20 of these only one or two casualties were alleged. In such cases, when I requested explanations, the airforce turned up with maps, to explain the military targets they had attacked. Even if they were brilliant actors, the few actual allegations that were made suggest at worst a few instances of collateral damage. Again, though army explanations were not always thorough, given the wide field of action, until the end of 2008 there were allegations of only 78 civilian casualties. 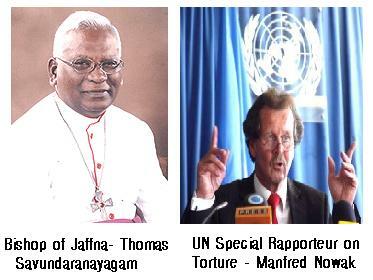 These got worse in 2009, but on the first day on which there were large numbers, the UN sent me an SMS (having raised questions earlier) to say they believed most of the firing had come from the LTTE. This is borne out by the appeal of the Bishop of Jaffna, issued on that day. However the Sri Lankan government has recognized that in other areas we must improve our record. We have engaged with the UN Special Rapporteur on Torture, and senior police officers agree with one of his principal recommendations, that more training is essential – not only in Human Rights awareness, but also in professionalism, to improve techniques of interrogation and investigation. Again, we had a spate of abductions, and also attacks on journalists, that should not be permitted. But while statistics are cited with no reference to period, it should be noted that many of these occurred in 2006, when the LTTE was on the retreat after the torments it had inflicted in particular on other Tamil political groups during what was meant to be a Ceasefire period. Government succeeded in lessening these over the next three years, as the reduction in the number of complaints registered with the Working Group in Geneva make clear. There were however some appalling aberrations, including the killing of Lasantha Wicrematunga, the Editor of the Sunday Leader. These matters are now being investigated, and information revealed in the international media suggests that once again responsibility may lie with rogue elements, certainly not with government as government. Ensuring that the rule of law takes its course is an obligation that we must hope government will not swerve from, whatever pressures are brought to bear by those who believe Human Rights are only a tool with which to blackguard Sri Lanka.